A fifth book “I am China” is of much better quality but it is her autobiography “Once upon a time in the East, a story of growing up” published in 2017 that should be welcomed as it is a great success. 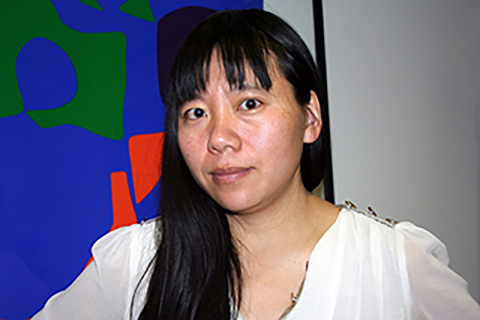 Guo Xiaolu is 45 years old, her daughter Moon was born in 2014, she lives in Hackney, a liberal and cosmopolitan area of ​​North London with an Australian philosopher Stephen Barker. She has also directed and produced twelve films (not distributed in China) which she hardly mentions in her book. She does not like the act of writing which is a solitary activity, and not good for the health of the individual! Moreover, languages ​​create real difficulties for her. She writes both in English and Chinese. But, as she often lives in Berlin, she also learns German. Chinese, but which Chinese, Mandarin of course but also the dialect of her province that allows her to understand the Wenzhou when she walks in Paris. As she says, “language is alienation, it does not allow me to feel at home. It tells me that I live in a place that is not for me”. This feeling is reinforced by the fact that as a British citizen, she no longer has a Chinese passport. No concentration on sordid aspects even if life is very hard. A monk interviewed by her grandmother tells her that she is a “fighting peasant” who will cross the seas and travel to the nine continents. At the age of eight, she will join her parents in Wenling, 12 hours by bus (today at two hours by car). Her mother has “a heart of stone”, she is a peasant woman who scorns villagers, barely knows how to write her name but, with a Maoist ideology, has long been a member of the dance and propaganda troupe of her factory. She married Xiaolu’s father, despite the opposition of her family; he is certainly a convinced Communist but he is a teacher and wanted to draw and paint. After the episode of “The Hundred Flowers”, he is sent to a hard labour center in a quarry. He will later be rehabilitated and recruited by the city’s Bureau of Culture. In Wenling, the Cultural Revolution is now over, but daily life remains saturated with political propaganda. All were involved and many suffered even though the locals do not really understand what happened. Xiaolu’s relationship with her mother is bad and her contacts with her brother are very limited. She is embarrassed at school by eye problems but will only wear glasses until much later in Beijing. At the age of twelve, she is raped by a colleague of her father, whose identity she gives. Later, for over a year, she will be the lover of her science teacher; an abortion at the hospital in a nearby town will close this relationship. She reads a lot, writes, publishes her poems with some success. She is a follower of the group of Chinese modernist poets, the “Misty Poets”. She is more independent from her family; her grandmother cannot live in Wenling with her mother; her father travels nearly a year along the Chinese coast to perform hundreds of sketches. In September 1993, at age 20, she moved to Beijing, she was accepted at the Film Academy where seven positions were available for 6000 candidates! Her long studies will allow her to meet filmmakers like Jia Zhangke, many marginal artists who remain very “macho”. Her friend Jiang beats her, she leaves him for Paul, a Western filmmaker for whom she is only an affair. She travels to China with an American, Andy, who has to leave China for Taiwan. She does not accept emotion relations men, especially Chinese. Her life and adventures in Beijing lead her to write a first novel, short, a little sloppy, published in Chinese and revised during its translation into English. She creates a character, Huizi, for whom she writes scripts, who is in fact Haizi, a very famous poet of the younger generation who committed suicide in 1989. Huizi quotes poems from Cha Haizong, the real name of Haizi and in particular a well-known text “Facing the ocean, the warmth of spring is blooming”. Many episodes of her life in Beijing are recorded and many of her loves, even if her failures lead her to become “a person who was very good at hiding her emotions. Maybe that was why people thought I was heartless “(p.80). But all the characters around her are sketches. 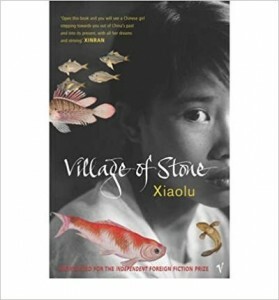 A second autobiographical novel is then published “Village of Stone” (1), an interesting and pleasant book, I have already mentioned. In Beijing, she cannot finance her films; she writes scenarios that are not accepted by censorship. She needs money and successfully writes TV series. It’s easier to be a writer than a director! Finally she obtains a scholarship for Chevening, a scholarship for future elites. She leaves Beijing in 2002 for Great Britain. She has to study documentary films production for one year at the National Film and TV School. She meets Daniel, a student from her school, also a delivery man, a bit hippy, in his family in Wales where Xiaolu joins him. She returns without regret to London to make a film and write in English “Concise Chinese-English Dictionary for lovers” (3). 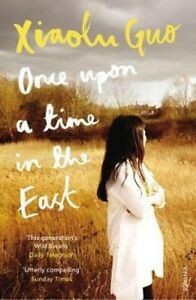 She sends the book to the publisher Toby Eady, who died a few weeks ago, the husband of novelist Xinran. A great success, a book translated into more than twenty languages. Two unconvincing books, in English, will follow, one per year. In “UFO in her Eyes” (7), a peasant woman sees a UFO in the sky over a neighbor’s rice fields. The arrival of the Beijing police, who does not understand the local dialect or the rules of the life in the village, is quite pleasant. The desire to innovate by stacking interviews does not convince and breaks the narrative of the novel. Local authorities invest and seek to attract tourists with this UFO. All this does not have the excessiveness or invention of Yan Lianke’s novel “Lenin’s Kisses” where the leaders want to buy Lenin’s mummy to develop tourism! In 2010, a collection of short stories “Lovers in the age of indifference” (8). A curious style where exchange of Emails and messages are used to write a short story. The last text, the story of Houyi and Chang’e seems to be there to fill in the 200 pages! A moving short story, “Stateless”, the hero is in an airport to board a plane; he is a loner, no one is waiting for him. He meets a little girl who cries, he stays to console her and misses his plane. She tells in her autobiography the visit of her parents in London; her father very weak with a throat cancer, her mother who tries to marry her with singles from good Wenling families living in Europe. She feels far away from her parents and her brother who has a big problem with alcohol. Travels to France and Italy but her father will die after returning to Beijing, and her mother after the birth of baby Moon; Guo Xiaolu finally feels free from the weight of her family in China. She worked for several years on “I am China”, published after the birth of her daughter. It is a very sophisticated book where she tries to demonstrate that she can be a novelist. Three characters: a rocker, punk star, famous in Beijing, Kublai Jian, his friend Deng Mu and a translator Iona Kirkpatrick, born in Scotland in the island of Mull. A publisher, Jonathan, receives in Beijing a file of letters and notes concerning this couple and transmits them to Iona. An ambitious construction that is read with pleasure. Jian is an activist who believes that art is necessarily political. During a concert, he releases a manifesto that will make him arrested and expelled. Mu is a poet, much more conformist, she does not want to live dangerously for ideas as the couple has just lost a baby of a few months. Jian does not get political asylum in Britain but in Switzerland. Mu, with Jian’s musicians, is touring the United States where she does not want to stay. Her correspondence with Jian is often lost but both and this is a little surprising, do not try to find each other abroad. A split which originates from before the death of their son, Little Shu. Another element which is surprising to say the least is that Jian’s father, with whom he had very bad relations in his childhood, has become a major political figure and it is he who will have Jian expelled from China. The character of the two heroes is interesting and has been given a lot of attention; on the other hand, the personality of Iona is the caricature of an intellectual and her lovers of one night. But it is Jian who can conclude: “I am China. We are China. The people not the State “. 1) Guo Xiaolu, ” La Ville de Pierre”, translated from the Chinese by Claude Payen. Philippe Picquier 2004. (2) Guo Xiaolu, “Village of Stone”, Chatto & Windus, 2004. (3) Guo Xiaolu, “Petit Dictionnaire chinois-anglais pour amants”, translated from the English by Catherine Laléchère. Buchet Chastel, 2008, 330 pages. (4) Gua Xiaolu, “20 Fragments d’une jeunesse vorace”, translated from the English by Catherine Laléchère. Buchet Chastel, 2009, 190 pages. 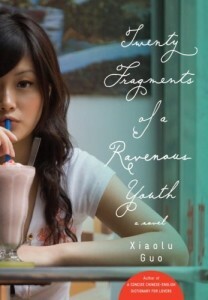 (5) Guo Xiaolu, “20 Fragments of a Ravenous Youth”, translated from the Chinese by Rebecca Morris. Chatto & Windus, 2008, 200 pages. (6) Guo Xiaolu, “Concise Chinese-English dictionary for lovers”, Chatto & Windus, 2007. (7) Guo Xiaolu, “UFO in her eyes”, Chatto & Windus, 2009, 190 pages. 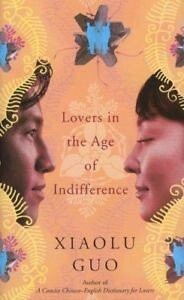 (8) Guo Xiaolu, “Lovers in the age of indifference”, Chatto & Windus, 2010, 210 pages. (9) Guo Xiaolu, “I am China”, Anchor Books, 2015, 370 pages. Guo Xiaolu, “Once upon a time in the East, a story of growing up”, Chatto & Windus, 2017, 315 pages.